I’m a little embarrassed to admit that my culinary focus of the last few months has been learning how to fry an egg. But I’m a lot proud to proclaim this egg-periment a success. That’s how my mom fries eggs. And every egg, every flip is nearly perfect. Sure, she’s had enough experience — fried eggs, along with sausage or bacon and pancakes or waffles, have been a staple of breakfasts at my parents’ cabin in northern Michigan for 40 years. I can still picture her in front of the old narrow white stove, frying sp-egg-tacular egg after egg, which my brothers and I promptly destroyed. Our dad had taught us to dice our eggs, then coat the tiny pieces of whites with the liquid yolk. I can’t tell you how much this irritated my mother. I’m not sure the sudden obsession with fried eggs last fall, but I became determined. My first challenge was figuring out which oil to use. My mother fries eggs in bacon grease, which she stores in a jar in the refrigerator. As much as I love bacon, this has always grossed me out. Since I’m spoiled, she fries mine in butter before the rest of the family’s. (A total win-win, in my book.) I first experimented with olive oil and coconut oil sprays; both left an off taste that didn’t complement the eggs, especially the coconut oil. Butter browned the eggs too much for my liking. The clear winner was clarified butter. Absent of milk solids, clarified butter (or ghee) turns to oil almost immediately and has a high smoke point — helpful when you keep the flame on your burner a little high like I tend to do. Cooking in oil also helped me in the successful flipping of an egg. With the spray, the egg didn’t want to budge half the time. 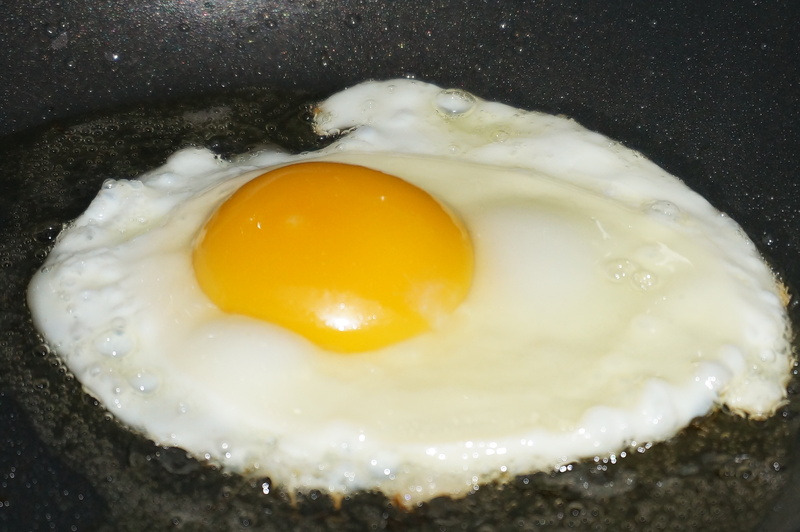 But with the oil, the spatula slides right under the egg, and over it goes. Nice and easy. There was also a learning curve with figuring out how long to cook the egg once it’s been flipped. Like I said, I hate runny whites. I’ll confess that I overcooked a few, although never to the point that the yolk was hard. My mom told me just today that she turns off the burner as soon as she flips the egg. Question: Why in the heck didn’t I talk to her about this months ago? Needless to say, I now have a fried egg for breakfast nearly every day. Some days, it’s an egg with a slice of wheat toast. 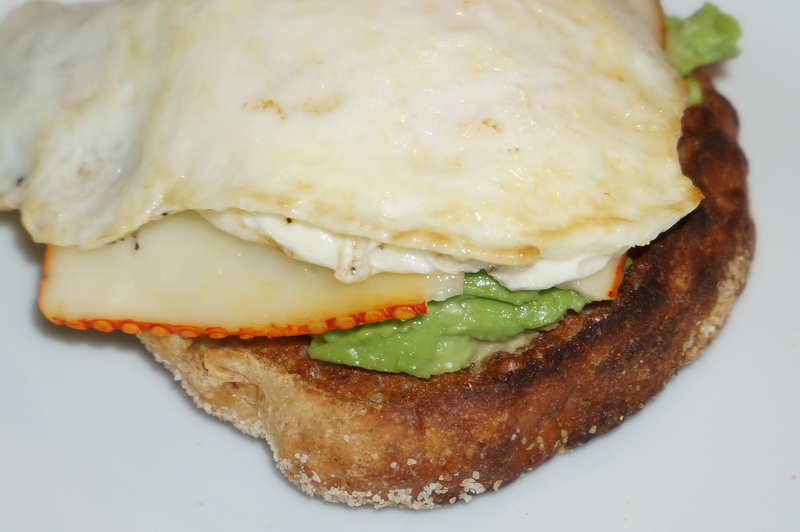 Lately, it’s been a “California benedict”: an ounce of avocado mashed onto half an English muffin, topped with muenster cheese, and finished with one glorious, perfectly fried egg. I know what you’re thinking … egg-cellent. And you’re right.